We have fought many oorlogen (wars). And wars are so gruwelijk (cruel), because the levens (lives) of so many mensen (people) are destroyed, and many levens are lost. In order to remember how cruel and terrible wars are, many countries have remembrance or memorial days. And many are in May, because it was in May 1945 that the Germans capitulated in the Second World War. The Dutch one is today. Today is the Nationale Dodenherdenking (National Remembrance of the Dead) in the Netherlands, also sometimes just referred to as 4 mei. It remembers alle Nederlandse slachtoffers sinds het uitbreken van de Tweede Wereldoorlog (all Dutch victims since the start of the Second World War). Officially, it starts at 18:00 (6pm CEST). At that time, the doors open for a church service in the Nieuwe Kerk in Amsterdam, which starts at 18:50 (6:50pm CEST). It is the so-called herdenkingsbijeenkomst (remembrance meeting). Then there is the 4 mei-voordracht (May 4 presentation) by a Dutch auteur (author), a different one each year. Hereafter, there is ensemble music and the Onze Vader (Lord’s Prayer) towards the end. It ends at 19:20 (7:20pm CEST) with the Dutch national anthem, the Wilhelmus. Then, the guests move to the Dam. At the Dam, the herdenkingsplechtigheid (remembrance solemnity) starts at 19:50 (7:50pm CEST). The koning (king) Willem-Alexander and the koningin (queen) Maxima will lay a krans (wreath) at the Dam, the so-called kranslegging. The Taptoe-signaal (Taptoe signal) is played just before the beginning of the twee minuten stilte (two minutes of silence) at 20:00 (8pm CEST) tonight. It is comparable to the British Last Post or the American Taps. You can see it in the video below, including the beginning of the twee minuten stilte. Also notice the vlag halfstok (flag half-staff), which mourns the fallen burgers en soldaten (citizens and soldiers). The twee minuten stilte counts for the entire country, and so it is requested to give everybody the chance to have that silence for two minutes. So no parties and the like should be organized around that time. This is followed by a toespraak (speech) by the burgemeester (mayor) of Amsterdam, Eberhard van der Laan, and more kranslegging by certain high-ranking people in public office. Finally, school children will lay flowers (bloemlegging). Then finally, at 20:20 (8:20pm CEST) it is time for the defilé (parade), where the koning and koningin walk off past the kransen. Now, all other people have the chance to lay flowers. Of course, there are herdenkingen (remembrances) in many other parts of the country as well. This is just the official one. If you want to find a local herdenking close to you, find it here. 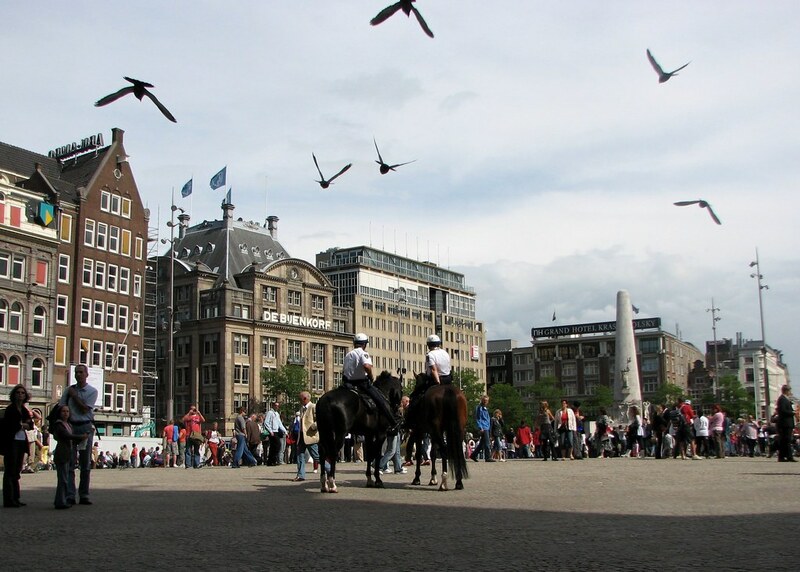 Tomorrow, May 5, is Bevrijdingsdag (Liberation Day), on which the Dutch celebrate the liberation from the German oppression and occupation of the Second World War. It is celebrated in a big way – but more on that tomorrow! Is there such a Remembrance Day in your country? And what do you think about it? Let me know in the comments below! Thanks for another interesting article. “Merchant seamen” or “the merchant marine” would have been better translations for “het koopvaardijpersoneel.” It is not a criticism, as you have given me the precise Dutch term.